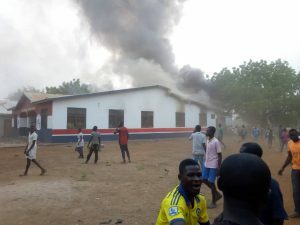 The New Patriotic Party (NPP) Secretary for the Salaga South constituency in the Northern region, Abdullah Habib Abiola, has confirmed on Frontline on Rainbow Radio 87.5 Fm that, majority of the irate youth who set the office of the party on fire were members. ‘’We can identify some of them and the police have also picked some of them […] Majority of them are party members,’’ he said. He told host Kwabena Agyapong some of the irate youth were members of the opposition National Democratic Congress (NDC). He said, the youth of the area felt Salaga should have been the capital because they felt they contributed massively to the victory of the NPP in 2016. Mr Habib Abiola said, the residents were expecting the president to take a political decision to favour Salaga because they voted for the NPP. He revealed the Salaga residents petitioned the party over their interest and the party knew the residents were going to be disappointed after Damango was chosen but we did not anticipate it was going to go to the extent of burning the party’s office.. The NPP officer said whatever decision the president has taken, is in the best interest of the people and so we will abide by it. Abdullah Habib Abiola was worried the youth may cause further mayhem if the security does not take up measures to calm nerves and protect lives and properties. Some angry youth on Tuesday set the NPP’s Salaga office ablaze after the president announced Damango as the capital of the newly created Savannah Region. The angry youth also destroyed billboards and other logistics of the party because they felt the capital should have been Salaga. The police have since arrested seven suspects.